They say that new plants take three years to establish but in the case of these three woody ornamental shrubs in my yard, five years is the magic number. 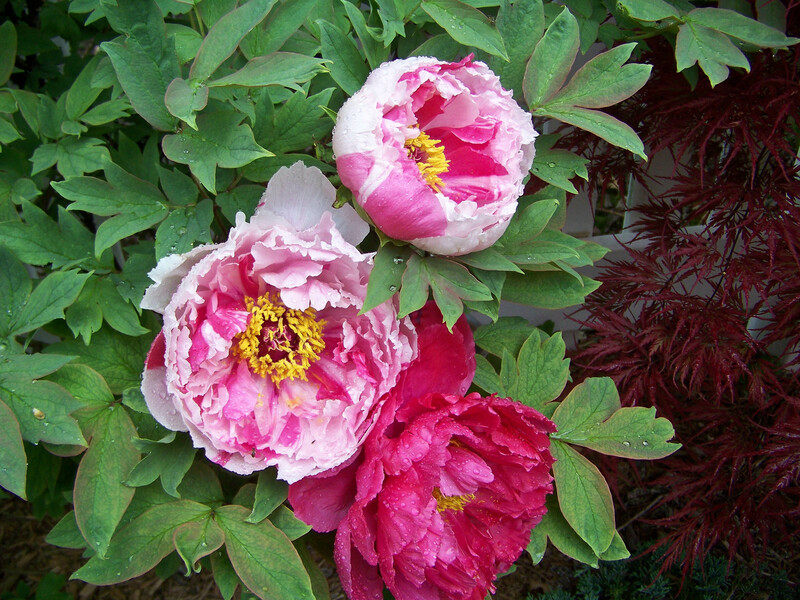 These three shrubs, planted in 2007, are stunning performers in my garden this year. 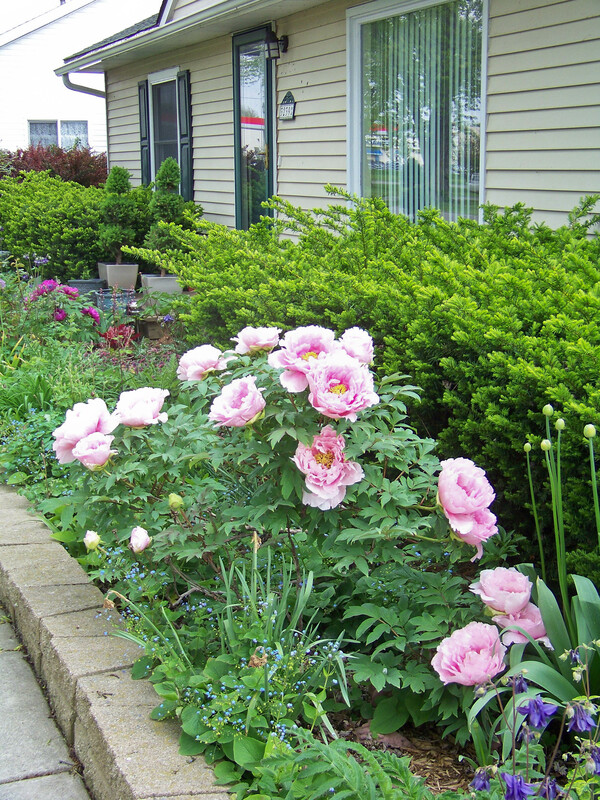 I love using flowering shrubs for three season interest and ease of maintenance. A bit of organic fertilizer or compost is all I have used on these shrubs, usually applied early in spring prior to blooming. This Weigela was loaded with blooms about two weeks ago. I have included a close up of the cone shaped blossoms. Gorgeous creamy pink blossoms complement dark purple foliage on this stunning Proven Winner Selection Sambucus nigara ‘Eva’ Blace Lace Elderberry. I have let it grow free form rather than prunning. In the past two weeks I’ve had several people in Irish Hills, Clinton Township and Monroe come up to me and ask me what’s happening to their Japanese Maple. Even my husband made a remark about it because he thought ours was dying. Relax, it’s not a serious problem. It’s frost damage. About two weeks ago we had that 20+ degree night and frost the next morning. This is the result. If your tree is looking like the photo below it got hit with the frost. 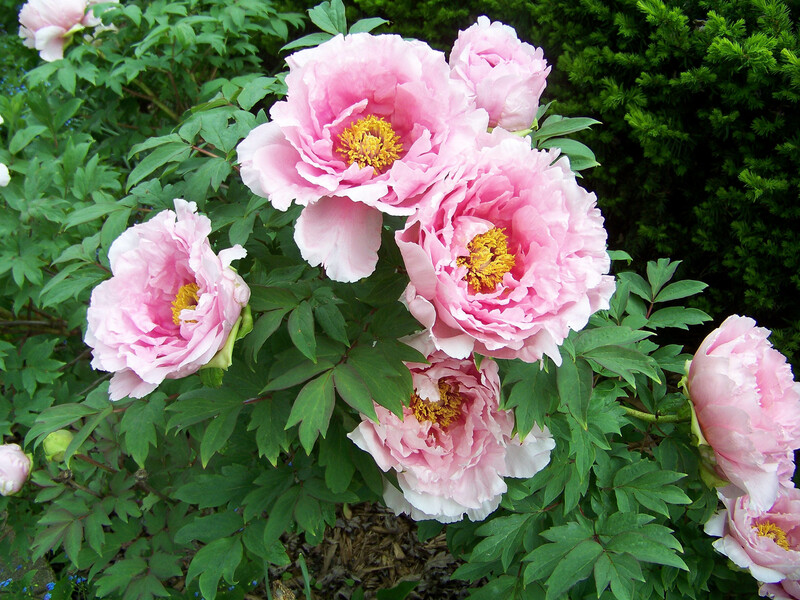 To improve its appearance you can take your shears or pruner and cut back the damage leaves. It may leave a tiny bare area but that will look better than those frost bitten foliage. No need to prune it back to the hardwood, just trim off the stem and dead foliage. It’s time-consuming, but it will look so much better. I wanted to post this for other public readers who follow our Blog. Home Orchard Pruning – Part 2. This is the second part of what turned out to being a magazine length article on the recent 2 1/2 hour pruning session MSUE Fruit Tree Specialist, Bob Tritten gave at the Stanger farm. Pruning often strikes terror in the heart of the average backyard orchardist. The most common fear is damaging or worse still, killing the tree by cutting off too much! Pruning is an art, but it can be learned by watching a pro in action to see how far you can go and why certain things are done. Then it is a matter of practice and common sense. The results are well worth the effort in more manageable and productive fruit trees. Decision time – what to keep. The most often asked question at the Conservation District plant and tree sale, is “how do I prune up my new fruit tree!” I hope the following points will help, as they are a brief summary of what Bob was asked during his presentation. If you still want more information, there is an excellent chapter in the Master Gardener handbook on fruit tree pruning – or go online and do a search of MSUE or any extension site for further research. Why prune: Fruit trees unlike ornamentals, are pruned to make them more manageable, promote healthy growing conditions for tree and fruit, and more productive. While some pears and apples can be seen in an espaliered form as a landscape accent, this is not the desired method of pruning for a backyard orchard. Fruit trees need air and light for optimum fruit development and a reduction of fungal diseases associated with poor air movement. When to Prune: This was the most asked question. Each tree should be pruned annually. Bob recommends March and beginning April as being the optimum timeframe for pome fruit, (apples and pears) – while late April to early May as being acceptable for stone fruits (peaches and apricots). The late winter or early spring cold weather offers ideal conditions for this kind of work. Most commercial orchards start this process in late December or early January, due to the large volume of trees needing attention. It is best not to prune during active budding. What to Prune: Bob stressed the need for developing a strong structural skeleton (scaffold) for the tree to be the most productive. He recommends a modified central leader form for all pome fruits and an open center, heart shaped structure for stone fruits. After making the choice of the branches to keep to establish the scaffold, the annual pruning shifts to being a maintenance chore. Dead wood, watersprouts, suckers, inward growing and crossing branches all should be removed. Watersprouts can be removed up to mid summer. This should be done religiously, as they take up sugars that the tree could otherwise put into fruit production. Bob demonstrated an alternate method of watersprout removal, by leaving some as stubs to provide some shading leafing. These would then be removed the following year. He cautioned against clipping the ends of the branches when shaping the tree, as this just leads to excessive sprouting. What about Frost Damage: With recent low temperature hovering around 33 deg, this is not a problem for the buds. But when this session was conducted a little over a month ago, it was. Two successive nights of 26 to 29 deg frost had caused considerable damage to the buds. The lowest temperature buds can tolerate for a short period is 28 deg without irreversible damage. When the bud dies, there is no fruit! Using a small pocket knife, he carefully pared the surface of a couple of random buds to reveal a thin brown layer – the sign of frost damage and a dead bud. What about Fruiting: Surprisingly dwarf stock trees begin to fruit within three (3) years. Bob advised removing this fruit to allow the tree time to establish its structure. Peaches are relatively short lived trees – about ten (10) years is the average productive life, as they are susceptible to a variety of killing cankers. Care should therefore be given to preserving the following year’s fruiting branches when pruning. 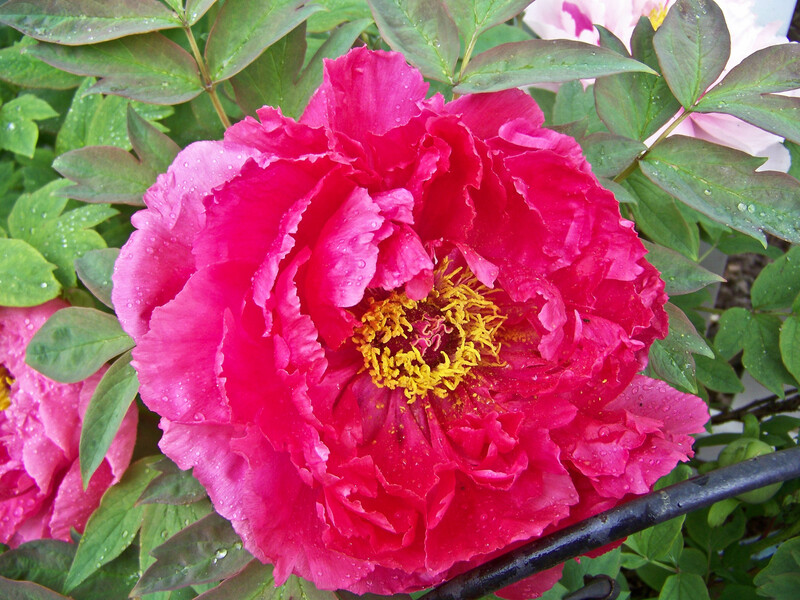 The same applies to pome fruit – so just do not hack away as if you were pruning an ornamental! Most fruit trees will self-thin if conditions are not ideal for fruit development. Fruit clusters should be examined and thinned according to branch strength. It is important there be leaf clusters nearby for maximum sugar uptake. What about Renovation: A frequent topic of concern to the backyard orchardist who has inherited an overgrown, neglected fruit tree and wants to return it to productivity. Bob’s approach is to take a long view of the tree, particularly one not grown on dwarf or semi-dwarf stock – and see if the scaffold branches can be identified. An old tree grown on regular stock will require ladder work to harvest and prune. So a decision has to be made if the tree is to be saved outside of aesthetic or sentimental landscape appeal. If it is to be renovated, start by removing the usual dead wood, watersprouts, ingrowing and crossing branches – but nothing major. This work is just to expose the bones of the tree, and should not be more than 20% by volume. The remaining renovation pruning should be over a three (3) year period and with no more than 30% removed annually. The object of all this work is to improve the scaffold branches of the tree. Care should be taken to ensure that the tree has adequate leafing branches to provide the sugars for regrowth purposes. You should not expect or encourage any fruit production during the initial renovation process. After the tree has been stabilized, fruiting should resume. Watersprouts can be trained to fill in bare spouts by bending them into place with ropes secured by stakes. To reduce the height of a mature neglected tree, Bob recommended making sure that there are sufficient well placed lower branches to form a scaffold. Often viewing the tree from a ladder will add a better dimensional picture of what is to remain and what has to go. This is the reason why well placed watersprouts may be essential to restoring the shape of the tree. What about Branch Kerfing: Stressing the need to have a scaffold branch at the correct angle to the trunk, Bob demonstrated this unusual technique on a 2″ dia limb that bending with a rope and stakes would be impossible. He made five (5) closely spaced saw kerfs half way through the underneath side of the branch. With some of the tension removed within the wood, he was able to bend and pull down the branch without breaking. The bent branch was then secured with a rope and stake. The wounds heal in about a season and do not require any form of dressing. Rule to remember: Bob’s mantra is you want to be able to throw a football through a well pruned fruit tree! Or have a good sized bird fly through the center. Open and airy are the two words he stressed throughout his presentation! Jennie will do a follow up article with more specifics on the pruning and care of the common fruit trees we find in our backyard orchards. Once again we should thank the Conservation District for sponsoring events like this for the education of the general public. This community involvement is all the more important, as we no longer have an extension walk in diagnostic clinic. Our thanks also go to Jennie Stanger for teaching these annual classes and for hosting this special guest. Would I miss a pruning session with Bob Tritten? Not likely! I was all prepared to pay $25 to attend his last appearance at the Tollgate Farm orchard – so it was a treat not to have to make the drive and only pay $5 thanks to the generosity of our local Conservation District in bringing him to Jennie’s farm. Braving the early morning chill and temperatures in the mid-thirties, I joined an eager crowd of about thirty five, including nine Master Gardeners, watching this master arborist working magic with his clippers. The only casualty was the MG camera whose batteries didn’t like the frosty weather – but this time I brought spares. Sue’s camcorder also suffered the same fate. Every time I visit Jennie, I always make a mental note of how good her fruit trees look! We were all a little dismayed when after a few minutes of Bob’s careful pruning, about 30% of what appeared to the backyard novice as a perfect peach tree – was lying on the ground! And Bob made such drastic surgery all appear necessary and quite appropriate with his easy to follow commentary. I last saw Bob in action about 13 years ago, climbing trees with a chainsaw and his other tools hanging from a belt – renovating an ancient orchard in Monroe. For those who don’t know, Bob is the Genesee County Extension Fruit Tree Specialist among other things. This means that he trains commercial orchard owners and workers how to prune fruit trees for maximum health and productivity. You can see his handiwork at Applewood Orchard just over the county line. The lesson began with a brief explanation of the tools of the trade – from an array of familiar Felco and Corona hand clippers, diamond sharpening stones, venerable wooden handled hand loppers, from the high end to the cheapies you lend your neighbor, pole pruners, wicked looking hand saws, a trusty gas chainsaw – to artful branch spreaders, ropes and a few good books on backyard fruit growing. He asked if we knew the differences between pome fruit – apples, pears, etc all having small seeds – and stone fruit such as peaches, plums, apricots, etc. For those of you who have forgotten, please dig out your green book and look under Fruit Trees! Jennie will cover these in a later follow-up article. He stressed the need to be familiar with these two types of fruit trees as each requires special pruning, which he would address when we went through the orchard. For demonstration purposes, he showed how to break in a new tree with three rapid cuts on a poor unsuspecting apple whip. His technique was simple and easy to follow. In the case of the apple, he first sized the tree to hip height before making the radical cuts, which he said was essential for good future branching. He showed the three (3) alternating buds at differing heights he wanted to keep which would form the future scaffolding branches of the growing tree. He also demonstrated how to maintain and encourage the Xmas tree shape that is desirable in pome trees. Next were the peach and apricot which require a more open, heart shaped structure. He achieved this desirable shape by removing the heart and just leaving three (3) opposing lateral branches at about a 70% angle to the trunk to form the scaffold. Bob likes to be able to throw a football through the center of the tree! Before moving out into the field, he showed how to train or renovate a slightly older tree – by using short wood spacers, clothes pins, weights or even a rope tethered to a stake – as a means of improving the angle of the fruit bearing branch to the trunk. These aids remain in place or until the tree attains the desires shape. As we followed him into the orchard, he gave a fast analysis of the tree ahead, and what he would do to improve things. In spite of an artificial shoulder and being well into his sixties, Bob is still remarkably agile in the air on his sturdy three legged orchard ladder. In no time he was lopping out watersprouts and ingrowing or crossing branches, as he brought the shape of the tree into a better form for maximum fruit production. He stressed that you almost have to plan two (2) years in advance to get a structure that will yield blossoms that develop into fruit the following year. I plan to have another article on some more of the specifics he covered in his lengthy presentation. Jennie will also post a more in depth one on the whys and wherefores of pruning. Sue is currently editing down about 2 1/2 hours of video tape into shorter YouTube videos, that she will post as instructional aids that will be available for download by our blog readers. Our thanks go to the Monroe County Conservation District and staffers, Catherine Acerboni and Bob Potter, for arranging the session – and to fellow Master Gardener and former Monroe County Horticulturalist, Jennie Stanger for graciously opening her farm for the event, and letting her orchard become the subject of the lesson. 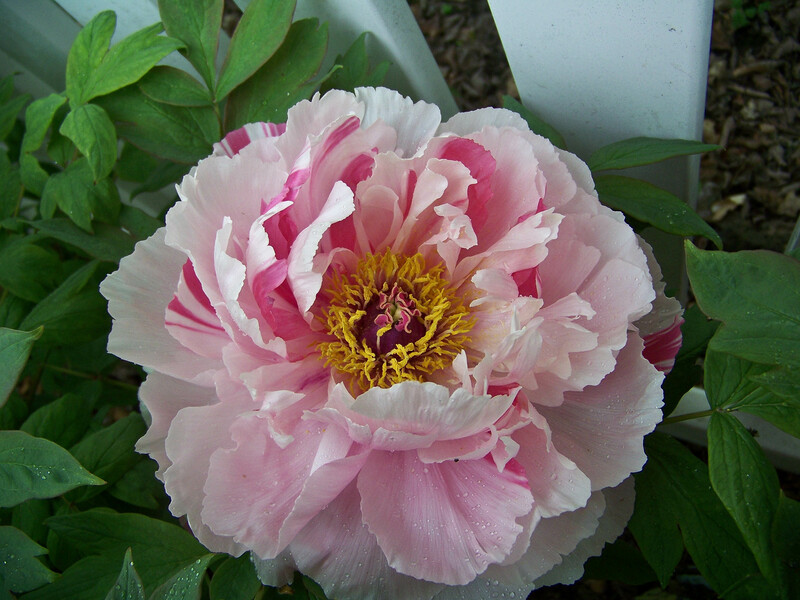 Linda Welch sent in photos of her tree peony specimens. They are stunning! I posted these in “gallery” style. Click on the first photo and you will be able to view each of these as a large image and you can advance to the next photo by clicking on the arrow. These are definitely worth viewing large!